Unique is often an abused, overused term in describing the exploits of humans. One who examines the life of Graves Peeler, however, may be able to call to mind other adjectives, but unique is certainly one that fits. As a brand inspector for the Texas and Southwestern Cattle Raisers Association, he set a high water mark in catching cattle thieves in the act and gathering the evidence necessary to get convictions in court. He faced danger many times in confronting desperate men preying on other men's livestock, and he held to justice and fair play despite threats on his life. In addition, more than anyone else, he made the singular contribution of being a prime mover in saving a piece of not only Texana, but also western Americana-the Longhorn breed of cattle. With untiring effort despite opposition, criticism, and even derision, Peeler put together what cowmen call a "set" of cattle that proved to be one of the most significant ever assembled. in them was' much of the diverse genetic heritage of today's Longhorns. These animals have offered the opportunity for the once almost extinct breed to re-emerge in numbers large enough to support registering the breed, which has seen widespread use for cross-breeding with other kinds of cattle. His lifelong association with cattle and ranching made this activity a natural part of his interest. 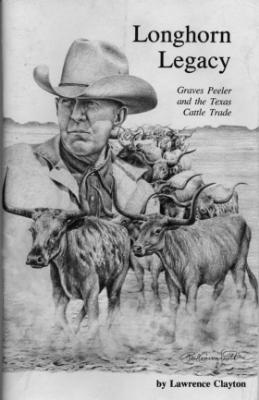 Peeler was also a hunter and collector of wild game and primitive artifacts. By the time of his death at age ninety, he had a remarkable collection of horns and heads of museum quality. These specimens are now placed in a suitable repository at the Conner Museum in Kingsville, where they are available for viewing. I knew the work of Graves Peeler long before I had even heard his name. I saw the result of his effort when I passed Ft. Griffin State Park north of Albany and saw the Longhorn herd grazing on the hills along the Clear Fork of the Brazos River around the old fort named Griffin. I did not know how these cattle came to be at the state park, but I knew they were a valuable addition. It was not until I met Leonard Stiles, retired manager of the Santa Gertrudis division of the King Ranch, that I began to appreciate the work of this ft man who had been Stiles' mentor in the business of brand inspection and, to some degree, in the livestock business. With Stiles' assistance I contacted Tommy Peeler, the executor of Peeler's estate, at his home in Pleasanton in South Texas. He graciously consented to allow me to write the following story, but without the efforts of Leonard Stiles, I would not have had the material to do so. We accept personal checks. Your item(s) will be shipped when your order in received in the mail. Please print and complete this form. For expedited orders, we will accept payment through PayPal with their 2.5% fee added to your order total. See buttons below each item. email Contact. Complete the form at the bottom of the page and we will contact you for additional information. Please DO NOT include your credit card information. We will contact you shortly for payment information. Thank you for your order.